Well, that didn’t take long. Less than a week into the season, we already have a big-name prospect coming to the big leagues. Better yet, he’s already hit his first home run. With Shin-Soo Choo sidelined by a calf strain, the Rangers have called upon top prospect Nomar Mazara. The move slots Mazara into the Rangers lineup much sooner than anyone anticipated. Not only has he played just 31 games above Double-A (including last year’s Triple-A playoffs), but he’s still two weeks shy of his 21st birthday. Yet, despite his youth and inexperience, Mazara has given the Rangers plenty of reason to believe he’s up for the challenge of hitting big-league pitching. After a strong .284/.357/.443 showing in Double-A last year, he kicked things up a notch by slashing .358/.409/.444 following a late-season promotion to Triple-A. He carried that success over to 2016 by slashing .375/.394/.500 in spring training, followed by an exceptionally loud three games in Triple-A. Lead prospect analyst Dan Farnsworth gave Mazara’s hit and power tools present grades of 50 on the 20-80 scale, which suggests he’s capable of hitting .260 with 15-18 homers right now. Interestingly, Mazara hasn’t always looked like a top prospect, at least not statistically. His tools earned him a $5 million signing bonus out of the Dominican when he was 16, but his performance in the low minors wasn’t great, especially in the contact department. 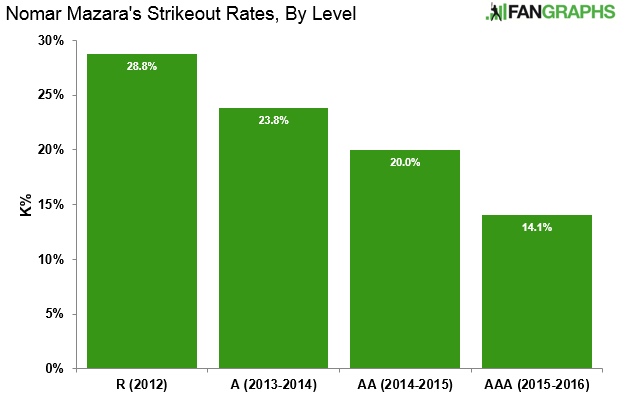 Mazara posted an alarming 29% strikeout rate in his first taste of pro ball, but he’s also slashed his strikeout rate every year since. In his 135 Triple-A plate appearances, he struck out just 14% of the time. I know, I know: I’m cherry-picking from a small sample to make a fun fact. But the point is that he’s come a long way. You don’t need any fancy math, or even a trendline, to see what’s happening in the following graphic. I’ve said mostly glowing things about Mazara thus far, and rightly so: He’s really good! But there’s a reason he isn’t mentioned in the same breath as guys like Corey Seager, J.P. Crawford, Orlando Arcia and Byron Buxton. Namely, most of Mazara’s value is tied to his bat. He’s a below-average runner (40 on the 20-80 scale), which undeniably limits him to an outfield corner. Additionally, his lack of speed also prevents him from doing much of anything on the base paths. Even without much foot speed, Mazara’s combination of contact, power and walks make him a very interesting prospect. It’s his age, however, that really sets him apart. He’s still just 20 years old, yet has already shown he’s too good for the Triple-A level. Hitters who dominate in the high minors at 20 frequently develop into solid regulars in a few years’ time. As a result, KATOH loves Mr. Mazara. My system pegs him for 8.8 WAR through this age-28 season, which represents the 14th-best projection in baseball. KATOH also rates him as the top Rangers prospect, placing him ahead of fellow top prospects Joey Gallo and Lewis Brinson. To put some faces to Mazara’s statistical profile, let’s go ahead and generate some statistical comps for the 20-year-old. I calculated a weighted Mahalanobis Distance between Mazara’s 2015 season and every Double-A and Triple-A season since 1990 in which a hitter recorded at least 400 plate appearances. In the table below, you’ll find the 10 most similar seasons, ranked from most to least similar. There are some very good names in there. Billy Butler was one of the top hitters in baseball for a while there. Grady Sizemore was even better, and although Mazara doesn’t have nearly the speed that Sizemore did, Sizemore’s bat in right field still makes for a great player. Further down the list, one finds a couple of more success stories in Jermaine Dye and Richard Hidalgo. Perhaps Dernell Stenson would have had a fine career as well, were he not tragically killed at the age of 25. Sure, there are some failed prospects in this group, but that will always be the case when you’re looking at 20-year-olds. Overall, I feel this list echoes both KATOH’s assessment and the scouting consensus — namely, that Mazara has a solid chance of being very good. In a baseball sense, this move makes all the sense in the world for the Rangers. Mazara has a very strong minor-league track record, and it looks even stronger the more recent you drop your arbitrary starting point. There’s little doubt he immediately makes the Rangers a better team. From a business perspective, however, it feels a little aggressive. If Mazara sticks in the big leagues for good, he’ll hit arbitration following the 2018 season, and will be eligible for free agency after 2021. If the Rangers had kept him in the minors for another week or so, they could have delayed all of that by a full year. Of course, the Rangers could still send him down for a brief time later in the year, but that might be hard to do if Mazara is raking. Whatever. Let’s not ruin this by overthinking mundane technicalities like service time and arbitration. The more interesting story is that one of the very best hitters in the minors is now a big leaguer, and we get to see him on the big stage sooner than we all expected. Given his minor-league performance — especially his recent minor-league performance — there’s little reason to think Mazara won’t be a productive player right out of the gate. And given his youth and scouting reputation, there’s a solid chance he’ll be a star down the road. Yesterday may have been just a glimpse of things to come. We hoped you liked reading Mazara Mania Comes Early in Texas by Chris Mitchell! I liked the projections you had mentioned for Mazara ROS, but I wondered if you felt like there is a significant chance for more from his power game. The kid is so young it would seem like he could make serious strides in that department and the swing looks plenty powerful. Couple in the park effects and I feel like he has reasonable chance to out perform those power figures. Sometimes we end up waiting for years on the power breakout, think James Loney, but it seems like when it comes it will often come pretty young. His projections seem to be all over the place, even in the sabermetric crowd. I read all the chats here as well as BP & KLaw. I’ve seen him described as a 315/30 guy who can field his position… but I’ve also seen 280/20+ hung on him… could be a superstar, could be James Loney. Thanks for your thoughts. I liked Bill James old system where he offered a projection stat line but also a projected bust and breakout %. This seemed to account for their being a range of possible outcomes much more than a straight stat projection would. I don’t know if hes still doing that though. Not sure the Loney comp is fair. Mazara hit 22 and 14 homers the past two years, while Loney averaged 5-10 in an era where homers were more common. More power is probably on the way, but Mazara’s already established a decent baseline. Thanks for the reply, I guess I only threw out Loney as the quintessential example of a player the fantasy community was hoping might take that step. His power never developed but with many of these rookies who hit the majors so early make the breakthrough in their early twenties. But as I said the projections look fair, I guess I just smell some upside beyond that. The projections I cited (.260 with 15-18 homers) came from Dan’s present scouting grades, and also happen to jibe with ZiPS/Steamer. That’s basically the expectation for now. With a young talented prospect like Mazara, though, there’s always the potential for a breakout (much moreso than with a veteran). Nobody saw Correa’s monster 2015 coming, for example. In the long-term, my math suggests he’ll be better than that.